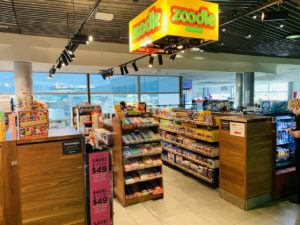 When I first saw the Zoodle retail format by UK newsagent chain WH Smith in 2012 it was primarily a kid-focussed store, at Melb0urne International Airport. A week ago, I saw a new incarnation of Zoodle, at the Virgin terminal in the Brisbane domestic airport. This latest version of Zoodle I got to see is quite different to what I had seen before. It is primarily airport convenience in focus, but with a presence of items for kids as well as some games. It certainly looks different to the usual airport convenience or news related retail, but on its shelves it offers the same products – candy, travel items, phone SIMs chilled drinks as well as coffee. Kids are represented, but not significantly. I like the layout, it is open and easy to shop. However, it remains traditional retail in approach. I didn’t see them embracing of the advances I have seen in US convention hence and airport retail businesses. Zoodle will send you on your travels with a smile. We have a great selection of children’s books, toys, gifts and games to keep young travellers happy, plus gadgets, snacks and treats for all. Whether you’re looking to keep the kids entertained on the flight, or looking for the perfect gift, we’ve got everything for the young and the young at heart. I wonder if what we are seeing is an evolution of Zoodle, ahead of what is on the corporate website. I also wonder if we will see it emerge outside of transit locations. On the hah street, this would be a fresh look – in my view, more interesting than the tired 7-Eleven.